Before the arrival of Christopher Columbus in the New World, the ancient Maya thrived and relatively rapidly disintegrated as a major political force. 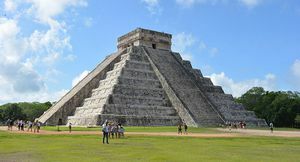 While the Maya, as a people, persisted long after the collapse of the Classical Maya civilizations, their cities were much reduced or abandoned by the time Columbus arrived. Did climate change have an important role in this? This is a question researchers have long tried to answer and recent answers might provide some new insights. The societies that were the precursors to the Maya experienced greater social complexity during the period between 2000 BC and 250 AD. Towns and soon cities such as Nakbe, Kaminaljuyu, and El-Mirador in Guatemala grew too large sizes. Agriculture focusing on maize, beans, and squash developed that helped lead to more long-term sedentary villages that also thrived through increased trade. Pottery and ceramic objects developed along with different forms of stone works, in particular, jade and obsidian works. Figure 1. 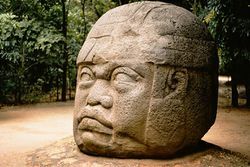 The Olmecs became very influential on Mayan culture and formed perhaps the earliest complex society in the Mayan regions. Communities began to form kingdoms and worship focused on the jaguar in different regions. Sacred kingship soon likely arose. The Olmecs in southern Mexico likely formed the first true complex society that would later influence the Classical Maya civilization as well as the Aztecs (Figure 1). The Olmecs spread throughout central and southern Mexico, while also spreading their influence south to Central America.